Surely no flower of the year can vie with this in spotless beauty. Its very transitoriness enhances its charm. Twice this past week I came across one of my favorite wildflowers, Bloodroot, Sanguinaria canadensis. 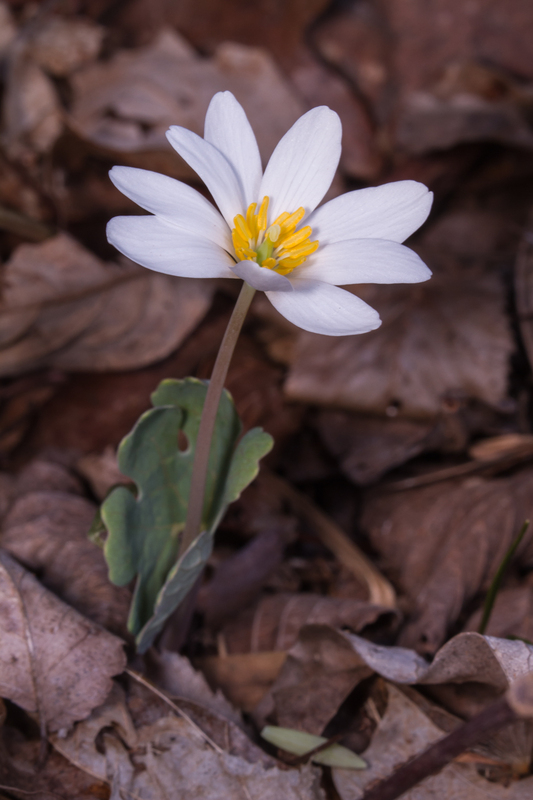 When open, the pure white flowers of Bloodroot are large and easily seen compared to the tiny blossoms of many of the other woodland spring wildflowers. But look fast, as each flower typically only lasts a couple of days before a slight breeze, rain, or other environmental disturbance causes the petals to drop. The flowers produce no nectar so any pollinators are either fooled by the showy blossoms or come to gather the pollen. As with several other early spring bloomers, Bloodroot can self-pollinate. This beautiful specimen was one of three seen at a short hike at Johnston Mill Nature Preserve in Orange County, one of several properties managed by the Triangle Land Conservancy. This otherwise delicate flower is named for the blood-red juice that escapes if you pick a leaf or cut into the rhizome. Native Americans used it as a dye and body paint and it is used now in some toothpaste brands to reduce plaque growth and fight decay. 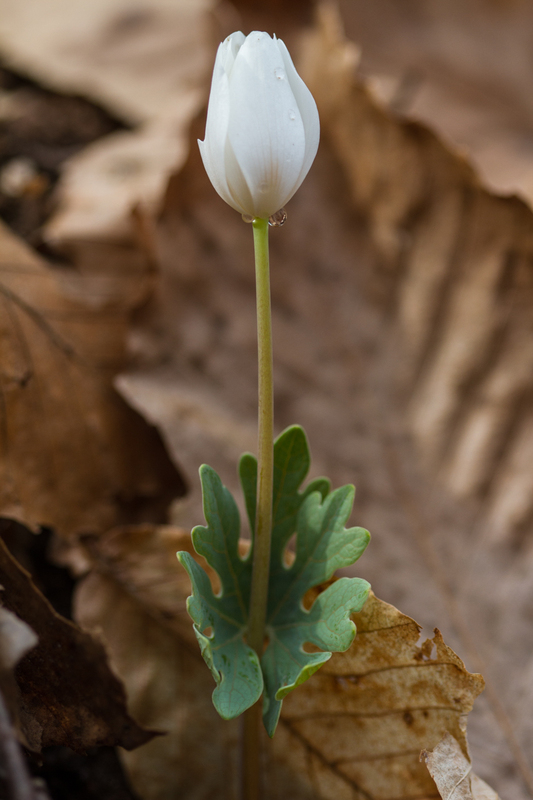 On the hike last week at Pilot Mountain State Park, we found a solitary Bloodroot growing on a steep bank above a stream. It was a single bud, seemingly protected by a curled leaf wrapped around the stem. After the flower blooms, the leaf expands and often becomes horizontal. A couple of years ago, I came across a single leaf on a steep slope at Swift Creek Bluffs Nature Preserve, another Triangle Land Conservancy property. 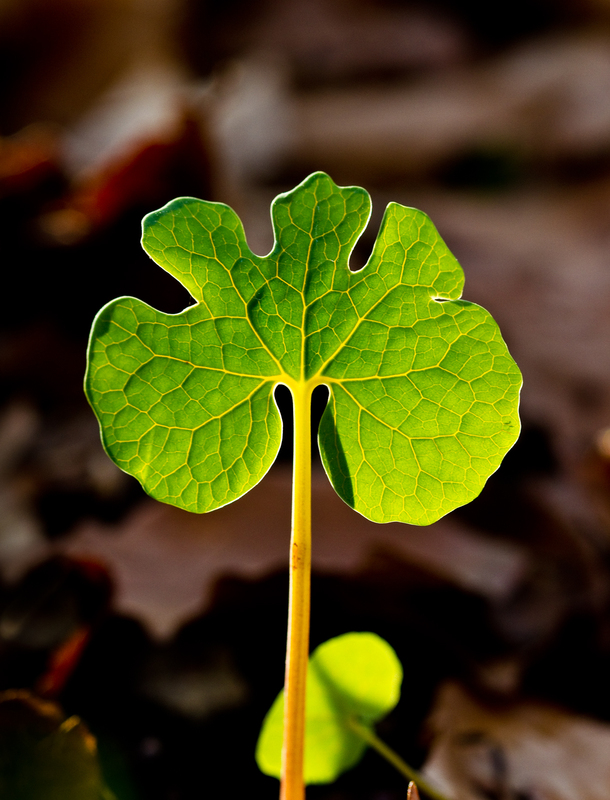 It glowed in the low angle light, highlighting the textured network of veins in the odd-shaped leaf. It was one of those moments when you simply are in awe of a small bit of nature. Even though their brief show is quickly passing in this part of the state, I hope to see more Bloodroot on upcoming trips to the mountains, as spring progresses up the slopes. Each encounter is time-well spent with a ephemeral woodland beauty. Amen and hats off to Mother Nature! Love the leaf shot. Your work, beautiful as always. Liz told me you were blogging so I looked you up!